Brief: Search ‘Ubuntu based distros’ on Google and laugh at the recommendations as Google shows Arch, Debian etc in the search result. Ubuntu is based on Debian. Debian is not based on other distribution. Arch Linux is a distribution independent of Debian or any other Linux distribution. This is what every Linux user already knows. This was shared on Reddit (I cannot find the link). 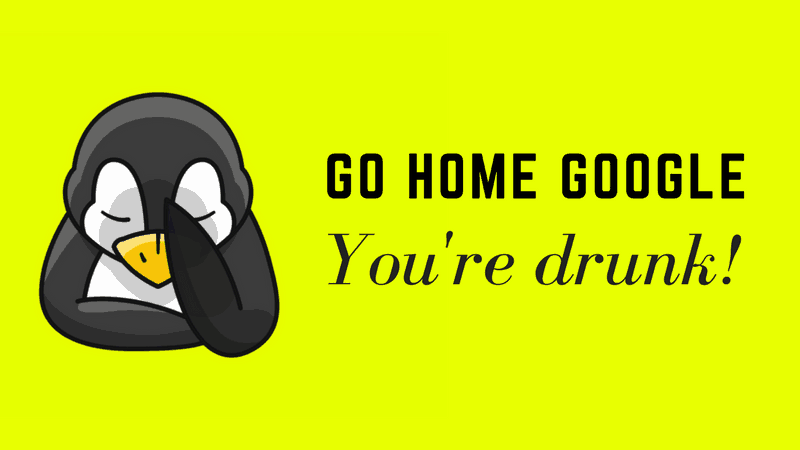 I found it amusing and shared it on It’s FOSS Facebook page. This is when a few readers pointed out that it’s not Google’s fault because it is getting the result from FossBytes. Is it FossByte’s fault then? The short answer is, No. If you try to search the same query again, Google shows similar recommendations from TechRadar. This time CentOS is also considered as an Ubuntu-based distribution. Why does this happen then? Is Google’s AI that stupid that it recommends Arch and CentOS as Ubuntu-based distributions? Why does Google think Arch Linux is based on Ubuntu? For that, you should have a slight understanding of how Google search works in this case. Lately, Google has started to answer your queries directly on the search page instead of giving you the links to the websites. This is called featured snippet in search engine optimization terms. Google scrapes some useful information from one of the top five websites for the searched terms and displays this information to save your time. And this is where things get interesting. If you look at the entire search result, you’ll know understand why Google displayed that weird recommendation. As you can see in the above picture, Google is displaying the information from the article that talks about best Linux distros of 2018. 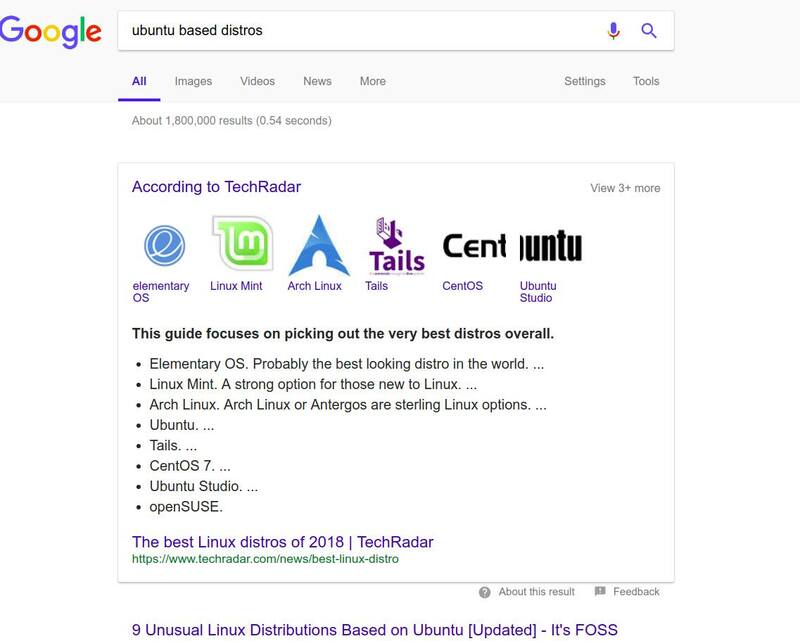 Why Google thinks that the best answer to ‘Ubuntu based distros’ is ‘Best Linux distros of 2018’ is beyond comprehension. Google works in mysterious ways after all. I know this article is not strictly a useful one but the next time you see a weird recommendation from Google in the search results, you would know the reason behind it. Featured image credit: Daniel Campos. A (artificial) yes, I (intelligence) no. Its just as stupid as the people writing the software, and they seem to be dumber than ever, at least in a rational, logical sense. Just because Google, Microsoft (who don’t even know the definition of “Operating System”) and other companies who practice in mind control, by using real intelligence and an understanding of psychology, have you fooled call their crap AI, doesn’t make it so! Can Google’s or anyone else’s search engine understand grammar and context, let alone common mistakes therein? No! How about linguistics and emotion? Not even remotely! Can it distinguish between technical info, price inquiries, entertainment… CNN vs the Onion, and so much other stuff, even though the information is hosted from or cached on their own servers to find and analyze (which it has been doing for years now without sucess)? I don’t see it. It doesn’t sort logically, nor does it even understand the first sort criteria “relevance” one bit! The day a computer becomes intelligent, anyone with an IQ above 71 should be able to recognize it right away! For now, anyone falling for the lie, and spreading it, especially in writing and reporting on technology should be ashamed of themselves! No wonder the masses are confused and getting dumber by the minute! And stop calling what it does “THINKING” It does not think, it runs comparisons and counts hits, with no understanding or thought whatsoever. This article only made it worse!